The single piece production offers many advantages to increase productivity within all production steps, but the biggest leap can be achieved in the surface finishing. Here a high personnel input has always been necessary, moreover the variation of parts in window production is very high. Therefore only a highly automated solution is applicable. 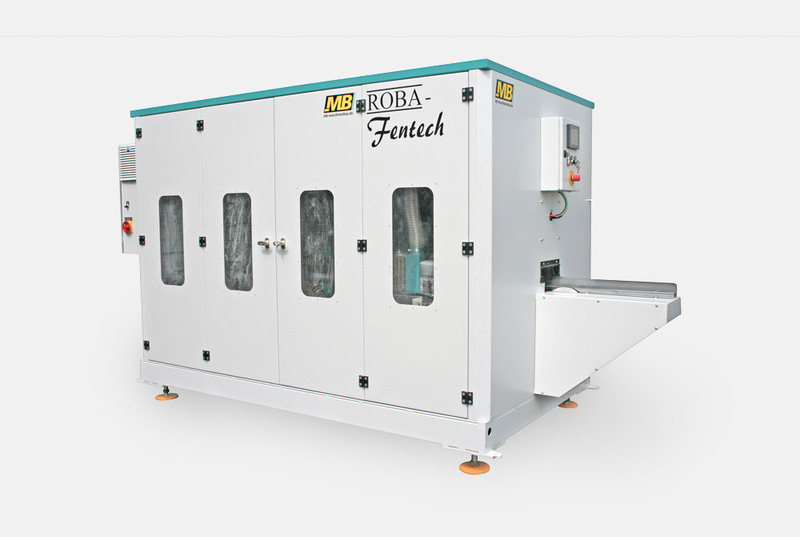 Time-consuming setting of the Fentech is omitted, which is made possible by the automatic part recognition at the inlet of the machine and the subsequent motorized adjustment of all sanding units. All wood and wood-aluminum work piece shapes are detected and converted into a corresponding sanding program. The work piece scanning calculates the part geometry and tells the aggregates in fractions of a second the basic position to move to. As soon as all units are in position, the work piece is released and sent through the machine. Extra-large 420 mm diameter sanding tools provide a maximized contact area with the work piece; a step-in and step-out control of the sanding heads ensures a gentle edge treatment and prolongs the life span of the abrasives. The 200 mm high side aggregates, which are responsible for the visible surfaces of the window frames, have an optimized PLC controlled oscillating stroke. Taking into account the height of the part the stroke is always driven in a way that all sanding elements are fully used. A novelty is the vacuum transport system, making it possible to send all kind of parts through the machine. Even short parts that previously could not be integrated in the sanding process, do not pose a problem anymore. The customer has the option to operate the machine as continuously through feed machine, or enable a reversal automatism in the sanding program. In this case the parts are sent through the machine with about 20 m/min for sanding and then returned back to the operator in rapid traverse of 60 m/min. In this way a one-man operation is possible at any time. Automatic work piece detection by scanner at machine infeed. Motorized positioning of the sanding units for all window profiles IV 70 – 105 and wood-aluminum systems. PLC controlled oscillating aggregate stroke optimizes the use of abrasives. Abrasive tool diameter of 420 mm to optimize the sanding quality in the plain and the milled area. Milled areas are always sanded in their best angle. The work piece scanner detects the optimum angle and the sanding unit automatically moves into position. The machine is available as continuous through feed or reversing plant for a one-man operation. Vacuum transport system for processing short parts. Encapsulated design for increased safety and dust-free environment. Fully automatic and all-sided sanding of all types of IV 70 – 105 and wood-aluminum windows systems. Large brush diameter to optimize the surface quality. Vacuum transport system also enables short parts. Program controlled swivel axis brings the top sanding unit in position. The large variety of parts in window industry needs a fully automatic solution.